The family-run Gallie Craig Coffee House is on the southern tip of the Scottish peninsula, "Rhin of Galloway", offering breathtaking views across the Irish Sea. 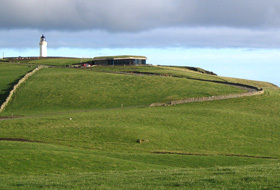 As the area around the lighthouse is a nature preserve, an environmental building concept was required in order to build Gallie Craig. 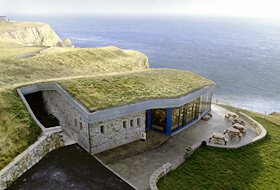 Disappeared: the green roof enables the building to become embedded in the surrounding grassy landscape. 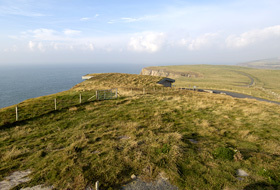 The cliffs are a landmark in the region, giving their name to the Gallie Craig, built in 2004, and which means more or less "craggy rock". The ZinCo system build-up with Floradrain® FD 40-E ensures the permanent establishment of maritime vegetation. Thanks to its environmental concept, Gallie Craig Coffee House was awarded the "Green Apple Award". The landscape is characterized by this steep cliff coastline, its beauty untouched. Gallie Craig can be a pioneering example in many places for adapted, sustainable building. 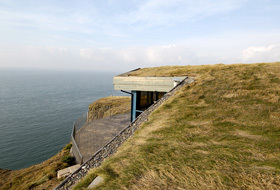 Breathtaking views across the Irish Sea, an exposed location on almost vertical cliffs and a building that has been integrated into the surrounding grassland in such a way that it is virtually invisible: Gallie Craig Coffee House on the southern tip of the Scottish peninsula “Rhins of Galloway” offers its visitors a very special ambience. Tourists treasure the tranquillity and the natural beauty of this untouched landscape. Special planning and approval were required to build Gallie Craig Coffee House in this nature reserve. A ZinCo green roof enabled the establishment of vegetation typical to the location, achieving an extraordinary level of harmony with the surrounding landscape. The name “Gallie Craig” is not accidental. 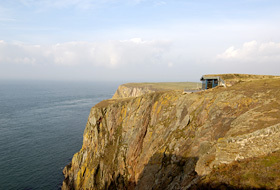 The “Mull of Galloway” headland on this Scottish peninsula rises out of the sea like a “craggy rock”. The beautifully-coloured cliff headland is a landmark in the region and is at the same time the most southerly point in Scotland. This area in the administrative district of Dumfries and Galloway, in the western Southern Uplands is becoming increasingly popular with tourists. The RSPB Nature Reserve, the Galloway Visitor Center and a 26 m high lighthouse dating from 1828 are just a few of the attractions. The landscape with its hilly character is of particular interest to scientists due to its fauna and flora and numerous animal and plant species are protected here. Lichen-covered rocks, rough grassland and maritime heather are part of the vegetation typical of this location. And, literally embedded into this landscape came Gallie Craig Coffee House in 2004, housing both a restaurant and a gift shop. Depending on the vagaries of the Scottish weather, the visitors can enjoy the spectacular views either directly from the terrace or from inside, through the panorama glass front. Angela and Harvey Sloan are the proud owners of this unique building that has managed to fit into the landscape in an environmentally-sensitive manner. An environmentally-sound building concept was required to obtain building permission in a nature reserve. Together with Architects I B MacFadzean from Stranraer, Harvey Sloan planned a building that would directly adopt the natural topography of the area. Most important here was the 400 m² large green roof for the building that connects seamlessly with the surrounding grass and heather landscape and on which the same grasses were to grow. The ZinCo green roofing system with Floradrain® FD 40-E for a simple intensive green roof was precisely what made this seamless connection possible. The materials for the green roof were supplied by our ZinCo partner in England, Alumasc Exteriors Building Products Ltd. Roofing contractors, South West Roofing from Dumfries were responsible for the professional installation of the green roof on the slightly-pitched roof. First, the roof waterproofing was laid, then the root-resistant layer. A protection mat SSM 45 was then installed followed by the core element in the system build-up: the drainage and water storage boards Floradrain® FD 40-E. These 40 mm deep elements are filled with the clay tile substrate Zincolit®, to best store rainwater and to make it available again by capillary means. Excess water is quickly drained away through the underlying channel system in the Floradrain® elements. The filter sheet SF provides a barrier between this drainage layer and the overlying 20 cm deep substrate layer. The substrate used here is one that is compact-resistant and suited to the local vegetation. This system build-up provided the basis for the permanent establishment of the required vegetation. Scotland is in the temperate climate zone, but is characterized by a tendency towards unsettled weather. 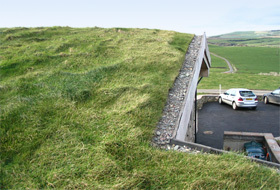 Even if long dry periods are relatively seldom, an additional irrigation system was required for the green roof. This is provided by a pump that draws its water first of all from rainwater stored in the roof and also from a well that is more than 20 m deep in the ground. Thanks to the innovative design of the building, the Gallie Craig Coffee House was awarded the “Green Apple Award”. The award is presented each year by the independent environmental organisation, The Green Organisation, which honours environmental projects all around the world. The owner of Gallie Craig Coffee House, Harvey Sloan, has also won an award in his own right. 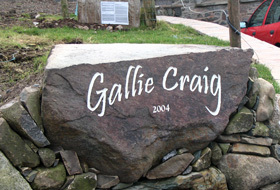 In 2005, he won the Scottish Enterprise “Individual of the Year” award for Gallie Craig – as a pioneering example of how developed and undeveloped spaces can be combined seamlessly with each other. The vegetation typical for the area has established itself permanently thanks to ZinCo technology, and the natural character of this untouched landscape has remained unchanged. Created within a nature reserve, this concept can be repeated in many other places with the aim of achieving sustainability in urban development. With our ZinCo system build-up, virtually any type of vegetation required or already present at an existing site can be established.